Visited here April, May, & June 2014. I got my first bite of waakye (delicous rice and bean dish, served with spaghetti noodles, a handful of salad, and spicy shiito; usually eaten for breakfast, but can be found until the afternoon; pronounced watch-ay) and proceeded to eat it with my hand in the oven of a bus (it’s always a good idea to keep a plastic spoon on hand!) — note: with most street food in Ghana, you order by the amount of each portion; I usually get around 1GHS of waakye, and .50 GHS (50 peshwas) each of spaghetti and salad. You can also get a boiled (or boiled and then deep-fried) egg, or fish, or pretty much anything else you could think of! Guestline Lodge is where I stayed the majority of the time that I was in Kumasi, which was at least 1.5 months, on and off, making it feel a bit like home! — 16GHS for a single room and shared bathroom. Located in next to the STC bus station, in the “Adum” (pronounced: ad-joom) neighbourhood. Can be a long 15 minute walk from Kejetia (central tro station) in the heat of day, but is kind of a pain getting a taxi. Tros going to “Tech” go past it; get down near the Aseda House and walk up the street directly opposite. Technically private rooms, but the walls are basically cardboard with the top few feet of mesh, so zero percent soundproof or lightproof. Running water gets cut off to the upper floors during the afternoons, but is on the in the morning and evenings, and staff can always fetch you a bucket from downstairs. At the time, the infamous Vic Baboo’s restaurant was located in the ground floor, so if you’re craving something non-Ghanaian, you can bet that you’ll get what you are looking for here. Decently priced, but be nice to the staff, as they’re hugely overworked and criminally underpaid, but usually extremely lovely! I also checked out the “kumasi hostel” which is an extremely clean and quiet house in the Kwadaso Estate neighbourhood, on the Santasi tro line — 20GHS/night. 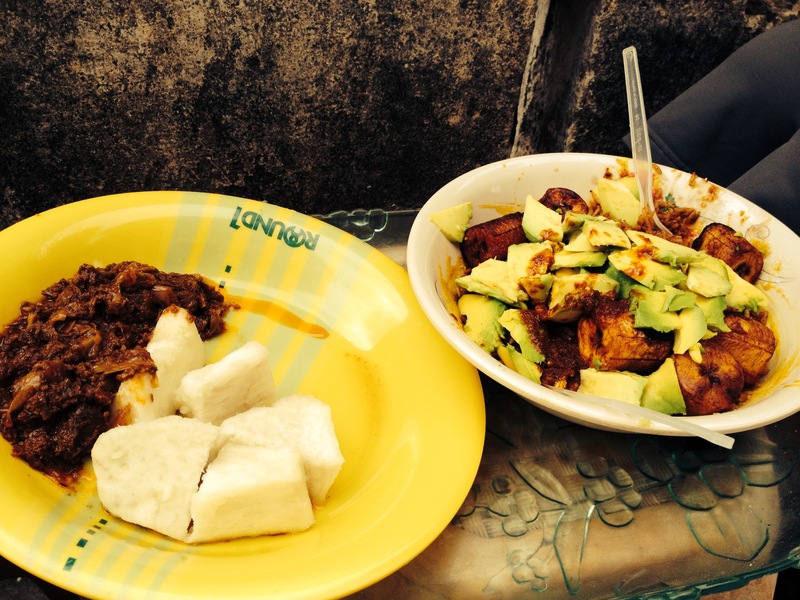 and gari with fried plantains and avocado, or yams and palavar sauce (I can’t describe it, just try it!). There’s also a stand on the corner that makes nescafe, tea, and fried eggs in the morning; you can get it on rice with crushed peppers or fried again in a sandwich. Waakye is down on the main street and down the street to the left. None of the above should cost more than 5GHS total. The tro-tro and shared taxi system in Kumasi is a complicated mess, and I cannot begin to explain it. They run on specified routes and pick up/drop off along the way. There are even specific hand gestures that signal different destinations! My advice: ask locals what tro you need to get where you’re going, and where to catch it. Once you get the hang of the routes you want, it’s not that bad. If you don’t want to deal with it, you can easily find private-hires. Good luck! Nsuta is my favourite place in Ghana; it’s where I volunteered in 2007. For a very average town, there is still an awful lot of volunteer action here on a pretty regular basis. Tro tro from Kejetia station — 4 GHS (plus no more than 2GHS for your bag). If you stay at Peach Tree, ask to get down at the “junction”, where the road splits between heading to Mampong and Nsuta. You’ll then walk towards Mampong. All accommodation is located awkwardly out on the edge of town, but is really only 15 minutes or so walking, or 1.4GHS to grab a taxi heading to/from the town of Mampong nearby. My personal favourite place to stay is called the Peachtree Guesthouse — small rooms, 25 GHS; large, 30 GHS. VIP offers the most comfortable, safe, and overly air conditioned ride. There are some for 25GHS and others for 35GHS; I think the difference may just be in the size of the seats, but I never tried the higher class version. I believe OA also runs a good service. It’s not too far, so Metro Mass Transit (MMT) or a tro is also an option, but traffic gets horrible in both cities, and the lack of AC can be pretty brutal once you’re stuck in a bus trying to crawl its way to the centre of town. You can find shared taxis from outside the VIP station heading to Osu – get down around Koala — 1.5GHS. The Salvation Army Hostel is the cheapest place I have found to stay in Accra, and it’s conveniently located in Osu, just down the road from Sunshine Salads. Very clean and lots of friendly people around, but this was the one time I was out late at night, and got mugged, so be careful! — 10GHS/night in a 6-bed dorm. From here, I seem to have lost my records of what I paid, so I’m going from memory! Get a tro on Ring Rd from Osu to Keneshie, and from there a tro to Kokrobite — 3 or 4 GHS total. I got an overpriced tro from Keneshie for I think 12 GHS. From Kokrobite, I think you can taxi or tro to the main Accra-Cape Coast highway and catch something heading that direction. Sammo Guesthouse is the most popular with tourists. Fairly clean and comfortable, though a bit damp due to the persistent humidity of CC. I was with a friend at this point and it was 35 for a double. CC Castle is the big draw here. Entrance was no more than 10GHS, but there is a 20GHS charge if you want to take photos! Private taxi is the best option for couples or groups of people to visit Kakum National Park (the canopy walk). You can take public cars to the town past the cutoff and walk in, but you may have trouble finding a car back, as they’ll all be full leaving the town. We hired one for 50GHS to drive out, wait, and then drive back. Admission was about 30/40GHS (half if you bring a valid student ID). If you’re in need of novels, check out the Black Star Bookshop! taxied to the CC tro station in the afternoon, and headed to Kumasi – I think 10-15 GHS. We were trying to get a lot of birds hit with few stones in a short period of time. So there was a bloody hot mess made of a couple days in ridiculously hot tros; not really worthwhile, in my opinion. Next time, coming directly from Kumasi, I would try going to Techiman, make the trip to Boabeng, then I would personally skip Kintampo and stay in Techiman overnight instead (OR, if you have time and can find a bus, get yourself to Tamale the same day). Then, the next morning, I would take an early bus to Tamale and meet up with the afternoon MMT into Mole. They say you should have your ticket well in advance, so if you cannot get to Tamale the day before, try to make friends with someone who can call and pull some strings for you to reserve a seat! Shared taxi from Nkoranza to whichever town is past it (just ask for the monkey sanctuary). Flagged and paid a deposit on another car after the tour, which was on its way to that town, to make sure to pick us up on the way back. There is only one hotel at Mole NP, and they know it. 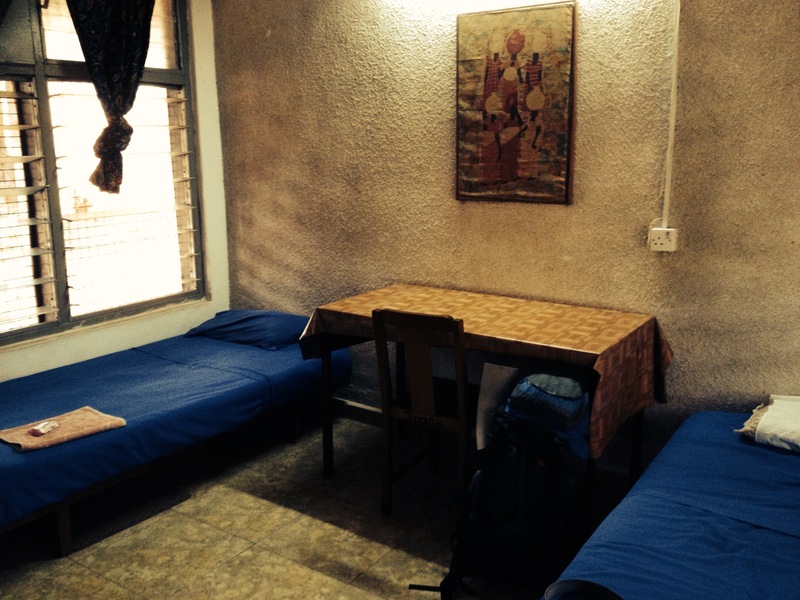 Dorm rooms are 24 GHS, but are clean and comfortable. The restaurant is overpriced, but we heard that during the day, there is a staff canteen on the grounds that you could get food from as well! The MMT bus leaves at a ridiculous hour of the night. Desk clerk said 3am (and woke us up at 1:30 just in case, even when he said 2), but an engine problem caused a delayed start of 4:30 or so. You get comfortable and stretched out, expecting to be the only ones on the bus, but it gets FULL. Arrive to tamale in the morning, with plenty of time to catch something else for your onward journey, but we stayed in Tamale instead, to check it out. We checked out the Catholic guesthouse, but found their prices to be higher than we were expecting, so we went on to find the TICCS guesthouse, which was a wonderful, wonderful decision. TICCS (The institute for cross-cultural studies) has such lovely grounds, very clean and comfortable rooms, and best of all… a mini fridge! It was extremely hot while we were there, and this little beauty made our water sachets into ICE. So we stayed 2 nights, and loved every minute of it — max. 40 GHS for a double room. TICCS is a long walk from the bus station, but you can get a private taxi to take you for about 5-8 GHS. It is located on the Bolga-Tamale hwy, and once you know where it is, shared taxis are frequent. We broke it up and stayed a night in Kumasi, but it is possible to take VIP, OA, MMT, or many other bus lines all the way. I arrived at the MMT station in the morning, but it had already left. I ended up on a very nice and comfortable bus with DKM on the side, with AC for 30 GHS. Pretty pricey, but it was nice for a treat! Accommodation in Wa is expensive, and all spread very far apart. I ended up at the Sen B Hotel, near the University of Development Studies — 47 GHS for a dbl (no singles were available). Quite a nice room, but it was more than I needed! At least the beers were cold and not overpriced! There are tros passing by regularly to go into town. Trade your GHS at the border!! The rate might not be amazing, but I could not find anyone to take them once I got to Bobo! Ouaga, maybe.. but play it safe and just trade them there.